Carl Linnaeus, the famous botanist and father of the modern classification system of plants, remarked that the branches of Staghorn Sumac (Rhus typhina) look like deer antlers in velvet. That’s in winter. In the fall our attention would surely focus on the spectacular show of leaves when they turn almost every color in the rainbow. 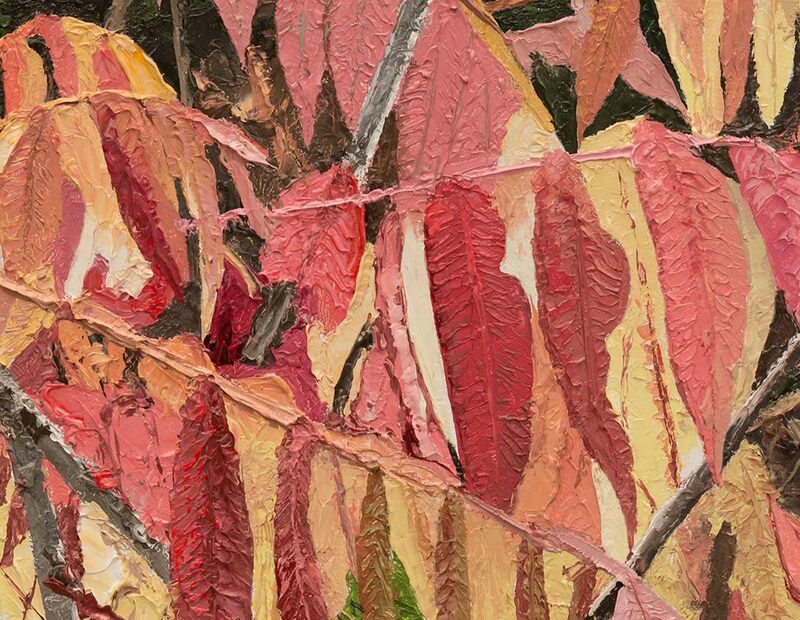 I was so taken with the range and variation of these colors that I decided to paint them very close up, focusing on leaves rather than branches. Sumacs have compound leaves—each leaf has many little leaflets joined to a single stem. 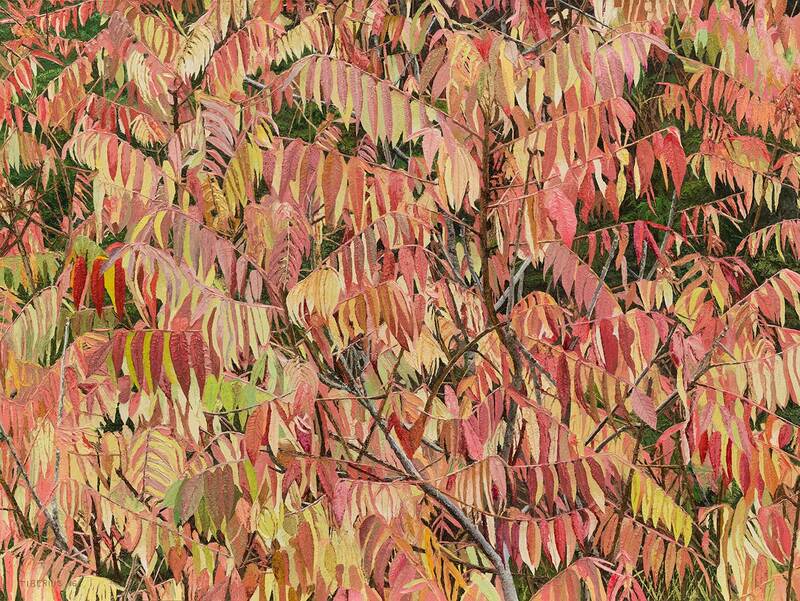 Surprisingly, each of these leaflets can take on a different fall color. And not only that, with this painting I observed something even more amazing: each leaflet can be one color on the outside and another on the inside! The inner sides of the leaves are pale yellow and green, a beautiful complement to the pinks on the outside. My daughter chose these pale greens and pinks for her wedding theme. Botanically, the greens are pale because the chlorophyll is being drawn out of the leaves along with other valuable nutrients as the tree prepares to shed them in fall. Not all of the chlorophyll has gone, however. There was enough left to provide the energy for production of large quantities of anthocyanins (the red pigments), but the process requires bright light and warmth during the day and cold nights. The bright light fuels the chlorophyll, which provides the energy for the process, and the cold nights trap the remaining sugars in the leaf providing raw material from which the pigments are made. Since the outsides of the leaves receive more light than the inner sides, they develop stronger reds. 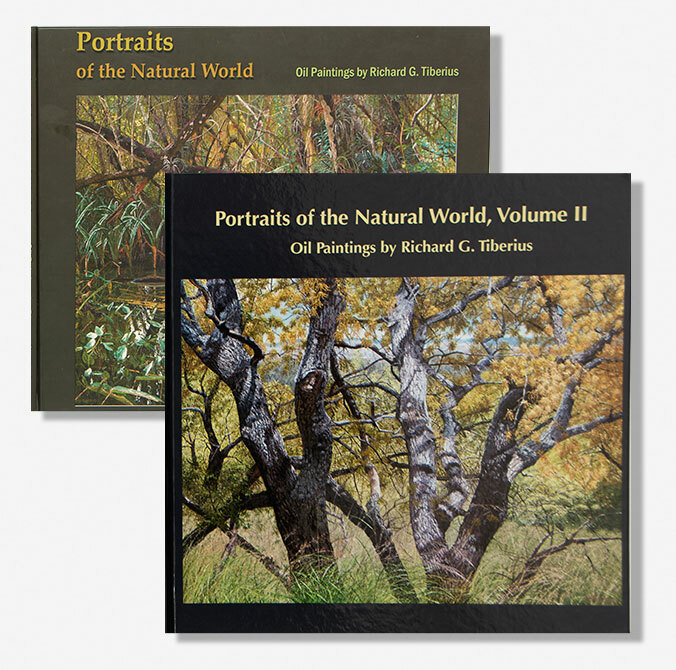 You can read more about leaf color in my favorite book on trees, “Trees: Their Natural History” by Peter A. Thomas. Can you please tell me how much this piece is selling for? Is it framed or unframed and are the colors of the piece what they appear to be in the picture? All our paintings are on hardboard with a wood backing for stability. From the side, you can see the edge of that backing, which is not visible from the front view. It is not necessary to frame our paintings with a decorative frame because we stain the wood sides of the panel with a colour that is complementary to the painting itself. Some people prefer the look of it without an exterior frame. However, you can frame them with a decorative frame if you wish. We will email you a price list of all of our available paintings. As for the accuracy of the colours in the website image, that is hard to answer because unfortunately different computer monitors may show slightly different colours and we don’t know how similar your monitor is to ours. We do our best to show the paintings as they are, but we just can’t guarantee that what we are looking at is truly the same as what you see on your screen. If necessary, we may be able to find some way of mailing you a printout so we can be sure what you see matches the colours of the original as accurately as possible. If you do decide to purchase a painting or print, we want to make sure you are happy with your purchase. Thank you for your interest.